Ben Stiller had one hell of a 2017, with two of the better films he’s ever been a part of. Not only was he at his best in them, but they were among the best of the year, a win-win if ever there was one. Stiller is known as a goofball, but he’s shown as he’s aged that he can be much more than funny, that he has talent to display when he so chooses and/or when the project is right. Walter Mitty was OK, Stiller directing himself, but The Meyerowitz Stories was something else entirely, Noah Baumbach delivering the strongest work of his career. 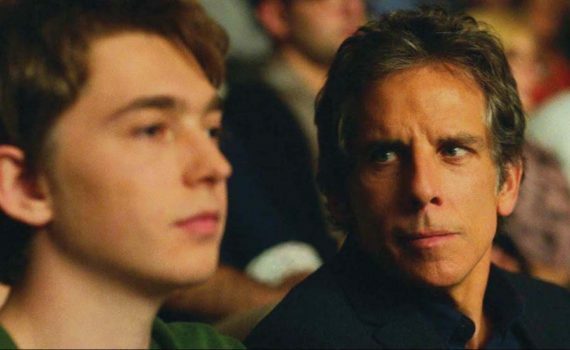 Now, with Brad’s Status, Stiller teams up with talented writer Mike White, takes the entire, heavy story on his shoulders, and shows that he can now be trusted to carry the load. It’s time for an important right of passage; the college visits tour. For Brad Sloan, it’s a time not only to take his son Troy to Boston to check out schools, but also to reflect on his own life, a timeline of missed opportunities and questionable choices. Brad works in non-profit, while his college friends are all highly successful self-made millionaires. One is already retired and lives on an island, one has the ear of the White House, one is a talented film director, one is a financial icon; it’s hard to feel good about yourself when you measure your happiness against private jets. Troy just wants to find a school where he fits in, but he’ll have to contend with his father’s mini-nervous breakdown along the way. The film starts with narration, which I’m not a fan of in dramas, but like in Wakefield, because it doesn’t disappear halfway through the plot, it works. Usually I’m yelling at the screen that I want the actors to show me their emotions, I don’t need narrators to tell me what the characters are feeling, but in this instance it works perfectly, as we enter Brad’s mind and we never leave. And it’s a complicated area, these emotions that he’s dealing with are extremely complex, as he tries his best to support his son while having to face the demons of his own past at the same time. A touch of fantasy, some bitter regret, but mostly hope; this film is filled with elements for us all to relate to, especially parents with growing children. Stiller has never been better, Abrams is perfect, and even though Jenna Fischer is such a bad actress that she couldn’t even play Pam well for more than the first half of The Office, we don’t see much of her so it’s OK. Brad’s friends are a cool group; Luke Wilson, Jemaine Clement, Michael Sheen, Mike White. And although White doesn’t direct much, he’s a veteran write, and knows how to weave a tale. This film works on all levels, and I recommend it strongly; it’s an under-the-radar great and one of 2017’s most special.